Our new focus on this region reflects a fundamental truth — the United States has been, and always will be, a Pacific nation. Asian immigrants helped build America, and millions of American families, including my own, cherish our ties to this region. From the bombing of Darwin to the liberation of Pacific islands, from the rice paddies of Southeast Asia to a cold Korean Peninsula, generations of Americans have served here, and died here — so democracies could take root; so economic miracles could lift hundreds of millions to prosperity. Americans have bled with you for this progress, and we will not allow it — we will never allow it to be reversed. Here, we see the future. As the world’s fastest-growing region — and home to more than half the global economy — the Asia Pacific is critical to achieving my highest priority, and that’s creating jobs and opportunity for the American people. With most of the world’s nuclear power and some half of humanity, Asia will largely define whether the century ahead will be marked by conflict or cooperation, needless suffering or human progress. As President, I have, therefore, made a deliberate and strategic decision — as a Pacific nation, the United States will play a larger and long-term role in shaping this region and its future, by upholding core principles and in close partnership with our allies and friends. Let me tell you what this means. First, we seek security, which is the foundation of peace and prosperity. We stand for an international order in which the rights and responsibilities of all nations and all people are upheld. Where international law and norms are enforced. Where commerce and freedom of navigation are not impeded. Where emerging powers contribute to regional security, and where disagreements are resolved peacefully. That’s the future that we seek. Now, I know that some in this region have wondered about America’s commitment to upholding these principles. So let me address this directly. As the United States puts our fiscal house in order, we are reducing our spending. And, yes, after a decade of extraordinary growth in our military budgets — and as we definitively end the war in Iraq, and begin to wind down the war in Afghanistan — we will make some reductions in defense spending. As we consider the future of our armed forces, we’ve begun a review that will identify our most important strategic interests and guide our defense priorities and spending over the coming decade. So here is what this region must know. As we end today’s wars, I have directed my national security team to make our presence and mission in the Asia Pacific a top priority. As a result, reductions in U.S. defense spending will not — I repeat, will not — come at the expense of the Asia Pacific. Indeed, we are already modernizing America’s defense posture across the Asia Pacific. It will be more broadly distributed — maintaining our strong presence in Japan and the Korean Peninsula, while enhancing our presence in Southeast Asia. Our posture will be more flexible — with new capabilities to ensure that our forces can operate freely. And our posture will be more sustainable, by helping allies and partners build their capacity, with more training and exercises. Since World War II, Australians have warmly welcomed American service members who’ve passed through. On behalf of the American people, I thank you for welcoming those who will come next, as they ensure that our alliance stays strong and ready for the tests of our time. We see America’s enhanced presence across Southeast Asia — in our partnership with Indonesia against piracy and violent extremism, and in our work with Malaysia to prevent proliferation; in the ships we’ll deploy to Singapore, and in our closer cooperation with Vietnam and Cambodia; and in our welcome of India as it “looks east” and plays a larger role as an Asian power. Meanwhile, the United States will continue our effort to build a cooperative relationship with China. All of our nations — Australia, the United States — all of our nations have a profound interest in the rise of a peaceful and prosperous China. That’s why the United States welcomes it. We’ve seen that China can be a partner from reducing tensions on the Korean Peninsula to preventing proliferation. And we’ll seek more opportunities for cooperation with Beijing, including greater communication between our militaries to promote understanding and avoid miscalculation. We will do this, even as we continue to speak candidly to Beijing about the importance of upholding international norms and respecting the universal human rights of the Chinese people. A secure and peaceful Asia is the foundation for the second area in which America is leading again, and that’s advancing our shared prosperity. History teaches us the greatest force the world has ever known for creating wealth and opportunity is free markets. So we seek economies that are open and transparent. We seek trade that is free and fair. And we seek an open international economic system, where rules are clear and every nation plays by them. We recognize that economic partnerships can’t just be about one nation extracting another’s resources. We understand that no long-term strategy for growth can be imposed from above. Real prosperity — prosperity that fosters innovation, and prosperity that endures — comes from unleashing our greatest economic resource, and that’s the entrepreneurial spirit, the talents of our people. So even as America competes aggressively in Asian markets, we’re forging the economic partnerships that create opportunity for all. Building on our historic trade agreement with South Korea, we’re working with Australia and our other APEC partners to create a seamless regional economy. And with Australia and other partners, we’re on track to achieve our most ambitious trade agreement yet, and a potential model for the entire region — the Trans-Pacific Partnership. The United States remains the world’s largest and most dynamic economy. But in an interconnected world, we all rise and fall together. That’s why I pushed so hard to put the G20 at the front and center of global economic decision-making — to give more nations a leadership role in managing the international economy, including Australia. And together, we saved the world economy from a depression. And now, our urgent challenge is to create the growth that puts people to work. We also need growth that is broad — not just for the few, but for the many — with reforms that protect consumers from abuse and a global commitment to end the corruption that stifles growth. We need growth that is balanced, because we will all prosper more when countries with large surpluses take action to boost demand at home. Every nation will contribute to the solution in its own way — and I know this issue is not without controversy, in both our countries. But what we can do — and what we are doing — is to work together to make unprecedented investments in clean energy, to increase energy efficiency, and to meet the commitments we made at Copenhagen and Cancun. We can do this, and we will. As we grow our economies, we’ll also remember the link between growth and good governance — the rule of law, transparent institutions, the equal administration of justice. Because history shows that, over the long run, democracy and economic growth go hand in hand. And prosperity without freedom is just another form of poverty. And this brings me to the final area where we are leading — our support for the fundamental rights of every human being. Every nation will chart its own course. Yet it is also true that certain rights are universal; among them, freedom of speech, freedom of the press, freedom of assembly, freedom of religion, and the freedom of citizens to choose their own leaders. These are not American rights, or Australian rights, or Western rights. These are human rights. They stir in every soul, as we’ve seen in the democracies that have succeeded here in Asia. Other models have been tried and they have failed — fascism and communism, rule by one man and rule by committee. And they failed for the same simple reason: They ignore the ultimate source of power and legitimacy — the will of the people. Yes, democracy can be messy and rough — I understand you mix it up quite well during Question Time. (Laughter.) But whatever our differences of party or of ideology, we know in our democracies we are blessed with the greatest form of government ever known to man. So as two great democracies, we speak up for those freedoms when they are threatened. We partner with emerging democracies, like Indonesia, to help strengthen the institutions upon which good governance depends. We encourage open government, because democracies depend on an informed and active citizenry. We help strengthen civil societies, because they empower our citizens to hold their governments accountable. And we advance the rights of all people — women, minorities and indigenous cultures — because when societies harness the potential of all their citizens, these societies are more successful, they are more prosperous and they are more just. This is the future we seek in the Asia Pacific — security, prosperity and dignity for all. That’s what we stand for. That’s who we are. That’s the future we will pursue, in partnership with allies and friends, and with every element of American power. So let there be no doubt: In the Asia Pacific in the 21st century, the United States of America is all in. It’s why women in this country demanded that their voices be heard, making Australia the first nation to let women vote and run for parliament and, one day, become Prime Minister. It’s why the people took to the streets — from Delhi to Seoul, from Manila to Jakarta — to throw off colonialism and dictatorship and build some of the world’s largest democracies. It’s why men of peace in saffron robes faced beatings and bullets, and why every day — from some of the world’s largest cities to dusty rural towns, in small acts of courage the world may never see — a student posts a blog; a citizen signs a charter; an activist remains unbowed, imprisoned in his home, just to have the same rights that we cherish here today. UN adopts “the freedom agenda”! The UN Security Council has voted for military intervention to facilitate regime change in Libya! UN Resolution 1973 which authorizes “all necessary measures” to protect the Libyan people from being crushed by Gaddafi’s army is an historic event. It’s been put in terms of a humanitarian intervention aimed at preventing atrocities against civilians (which it is, on one level), but in reality it goes far further than that. It’s actually a resolution aimed at ensuring the success of the democratic revolution in Libya. No way is it just a No Fly Zone, already the new COW has begun destroying Gaddafi’s military infrastructure, and the resolution has clearly been worded to allow attacks on ground troops, if required. And although it rules out occupation, it doesn’t specifically rule out on-the-ground operations. As I write this I’m listening to interviews with Egyptians who are at this very moment casting their votes in a referendum on constitutional reform. The euphoria is palpable. Democratic revolution really is sweeping the Middle East . The tyrants and autocrats of the region are all under threat now. With the passing of UN resolution 1970, suddenly “regime change” is ok , is becoming legitimate. So far in all the interviews I’ve heard, the question “Is this really about regime change”? has been dodged. Instead the talk is all about Gaddafi “killing his own people” and the need to stop this. But it’s pretty easy to join the dots. And it was France which spearheaded the push in the UN. What a change from 2003! Alain Juppe’s speech prior to the resolution talked of “a wave of great revolutions that would change the course of history” . But it was under the dreaded Bush regime that the “democracy agenda” was actually launched. In this time of great decision, I have come to Cairo not to talk about the past, but to look to the future — to a future that Egyptians can lead and can define. Ladies and Gentlemen: In our world today, a growing number of men and women are securing their liberty. And as these people gain the power to choose, they are creating democratic governments in order to protect their natural rights. We should all look to a future when every government respects the will of its citizens — because the ideal of democracy is universal. For 60 years, my country, the United States, pursued stability at the expense of democracy in this region here in the Middle East — and we achieved neither. Now, we are taking a different course. We are supporting the democratic aspirations of all people. certain basic rights for all their citizens — among these, the right to speak freely. The right to associate. The right to worship as you wish. The freedom to educate your children — boys and girls. And freedom from the midnight knock of the secret police. Securing these rights is the hope of every citizen, and the duty of every government. In my own country, the progress of democracy has been long and difficult. And given our history, the United States has no cause for false pride and we have every reason for humility. After all, America was founded by individuals who knew that all human beings — and the governments they create — are inherently imperfect. And the United States was born half free and half slave. And it was only in my lifetime that my government guaranteed the right to vote for all of its people. Whoops, wrong speech!! 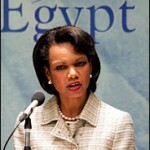 That was Condi Rice speaking in Cairo, back in 2005. 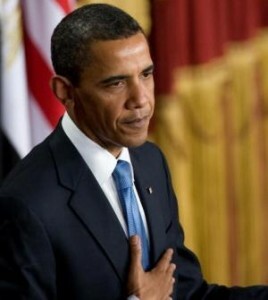 Obama’s speech was so much more..well, nuanced. Whereas Condi chose to focus on the struggle for democracy in the Middle East, Obama preferred to talk about “relationships”and in particular what he called “the tension between the USA and Muslims around the world”. What is central, according to Obama, is to understand difference, find what we share, discover our common humanity (etc etc..). As I said in a previous post, I think that Obama will have to continue what the Bush regime started, no other policy would make any sense..The biggest sign of this was that he spoke quite firmly about the need for a Palestinian State, and was prepared to arouse the wrath of the most militant Zionists. My half-baked view (which I’ll expand upon in my future post) is that he knows that he has no choice but to continue what was begun under Bush. Nothing else would make any sense. I think the main clue to this was in his remarks about the necessity for a Palestinian State. He was more forceful than I’d expected about this. "The Holy Bible tells us "Blessed are the peacemakers…" ' (or was it 'cheesemakers')..